As winter draws on I’m tempted to play Nielsen’s delightful; Springtime in Fünen. A more joyful, wide-eyed piece it is hard to imagine, and so very different from his worldly-wise Fourth and Fifth symphonies. These Danish recordings - originally released on Dacapo - are very welcome, especially at this bargain price. I much enjoyed their coupling of the First and Sixth - see review - so I had high hopes for their Fourth and Fifth. That said, the competition is fierce, not least from the likes of Ole Schmidt and the LSO - all six symphonies on Regis 3002 - and Herbert Blomstedt’s Danish Radio set on EMI (see Rob Barnett’s review). The craggy grandeur of Schmidt’s readings is without equal - he ‘terraces’ those great climaxes in a way that no-one else quite manages - but I’m impressed by Jukka-Pekka Saraste’s Finnish Radio performances as well (Finlandia 3984-21439-2). There are other fine versions, some of which Leslie Wright alluded to in his recent review of Schønwandt’s Fourth and Fifth. 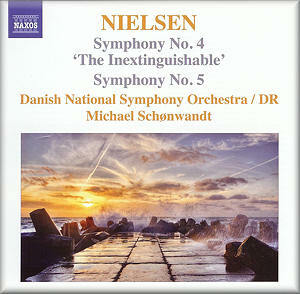 Nielsen’s Fourth Symphony, intended to express ‘the elemental will to live’, opens with wild outbursts underpinned by muscular timps and restless strings. Contrast that with the gentle, life-affirming melodies that follow - poignantly played by the Danish band - and the dialectic of this symphony is revealed. It’s easy to be riveted by Saraste’s more immediate, visceral view of this music, which is quite different from Schønwandt’s loftier, far-sighted approach. As a recording the Naxos disc sounds warm and spacious, with plenty of growl to the brass and bite to the strings. Moreover, the all-important timps are crisp and clear, especially in the quiet bridging passage that links the first two movements. There’s plenty of detail and point in the chamber-like Poco allegretto, the scampering string pizzicati and solo cello tune delightfully expressive. What a strange interlude this is - a moment of quiet reflection before the imperious timps’ return. Schønwandt is much more engaging here than Saraste who, as good as he is, doesn’t find nearly as much character and warmth in the notes. And at the start of the Poco adagio the latter’s timpanists are nowhere near as commanding as they can be, although they do make amends in the Con anima’s epic ‘duel of the drums’. Saraste is the impulsive one here, relishing the big moments; but it’s Schønwandt’s patient, more measured reading that best conveys the music’s inner tensions, its overall structure laid bare for all to see. It’s a simple choice, really; either one tends towards the more volatile Finnish performance - the build-up to the final peroration is especially thrilling - or one opts for Schønwandt’s more forensic approach. Alternatively one could be pusillanimous and plump for both - as I do - since both are very persuasive indeed. That said, neither matches the sheer authority and power of the Schmidt performance, which sound remarkable for their age. Nielsen’s next symphony - in the tradition of great Fifths - is probably his finest. It’s also one of the oddest, cast in two movements divided into six parts. Schønwandt certainly captures the sinister, somewhat lopsided, character of the Allegro giusto, epitomised by those weird bassoon calls. The invasive side-drums and the brutish march that follows add a sudden twist of Shostakovich to the proceedings. This is gritty stuff, the Danes playing with startling precision throughout. In the ensuing Adagio the horns may be a little less than unanimous but, as ever, Schønwandt never allows the pace to flag or pulse to flutter, even when the music subsides, only to be reinvigorated later on. The playing is wonderfully mellow here, which only highlights the raucous side-drums even more. And if you think Schønwandt is too reticent in the Fourth he proves otherwise in the gaunt climaxes of the Fifth. After that enigmatic conclusion to the Adagio, a robust, big-boned second movement cast in four parts - Allegro-Presto-Andante poco tranquillo-Allegro (Tempo 1) - it’s a mélange of competing moods, the delicate fabric of the Presto torn apart by the savage timps. Schønwandt and his band play with unusual ferocity here - just listen to the screeching brass - before modulating to that restorative Andante. The poise and purity of this music - in marked contrast to what has gone before - is superbly realised, although I did long for a more full-bodied string sound. No quibbles about the trenchant finale, though, which the Danes bring off with commendable energy and thrust, Schønwandt goading them on to a thrilling finish. Yet another barnstormer from Naxos and a disc that makes me even more impatient to hear Schønwandt’s readings of Nielsen’s Second and Third. My loyalty to Saraste isn’t entirely eroded, though, as the latter has his moments in the Fourth and brings real fire to the Fifth. Also, there is an edge to the Finnish performances - helped by a more astringent recording - that is strangely compelling. That said, the warmer, weightier Naxos sound will probably appeal to more listeners. But it’s Schønwandt’s unwavering grip on these scores that sets him apart. Indeed, for that reason alone these performances deserve their place alongside Schmidt’s pioneering versions.